The first time I heard of Kelly Yrarrazaval was a week ago at Tustin Wholefoods in Orange County . Upon hearing the cliff notes version of the story, I was immediately intrigued and wanted to meet the co-founder of Backyard Bees. 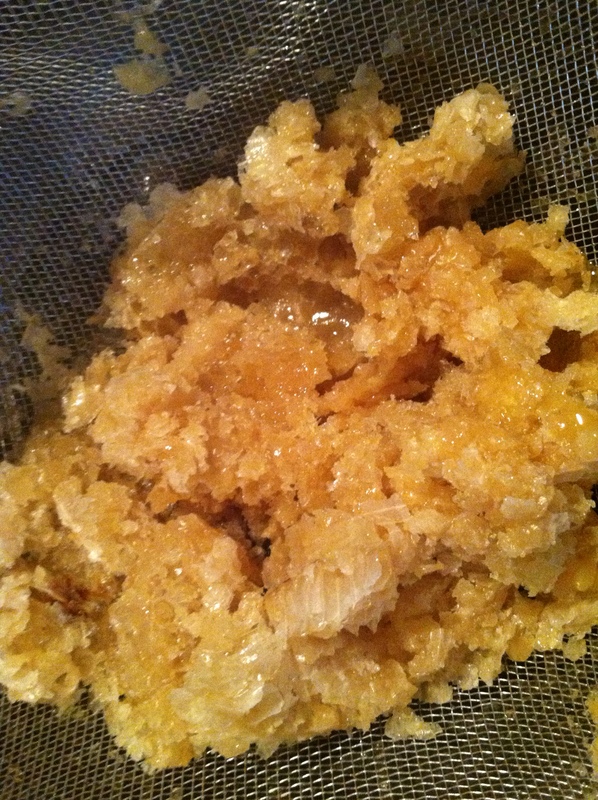 Here is my elevator pitch: “Backyard Bees is a company that saves local hives when called upon by homeowners, and produces raw honey from these hives.” Below are the remains of the honey comb that had just been strained to make raw honey. We connected immediately and my interest grew with every moment. A few days later, I found myself at the doorsteps of the Yrarrazaval residence. Kelly greeted me with a smile and immediately led me through her house, straight to her 1.5 acre backyard. It did not surprise me later when she revealed delightedly that she loved gardening. What I saw before me, was a testimony to her hobby. My irises enlarged with interest as we continued walking; over 30 fruit trees resided in this haven, a pen with hens that laid eggs every morning, a compost box, and several garden rows consisting of organic vegetables. Making my way through the walkway, I felt young again, and was reminded of my younger days of fruit picking in my backyard. Kelly quickly motioned to me and said “Over here, to the back over there.” We retraced our steps as I realized, “Right, the highlight of the tour, must be the beehive.” After being offered a loquat and eating it for the first time skin and all, I spat the seeds out as the owner did and scuttled down the narrow side yard. The novice bee enthusiast in me was conjuring images of a honeycomb stuck to the side of the fence. Instead, I was shown a white wooden box (seen above) about the size of a toddler’s dresser, pictured below. 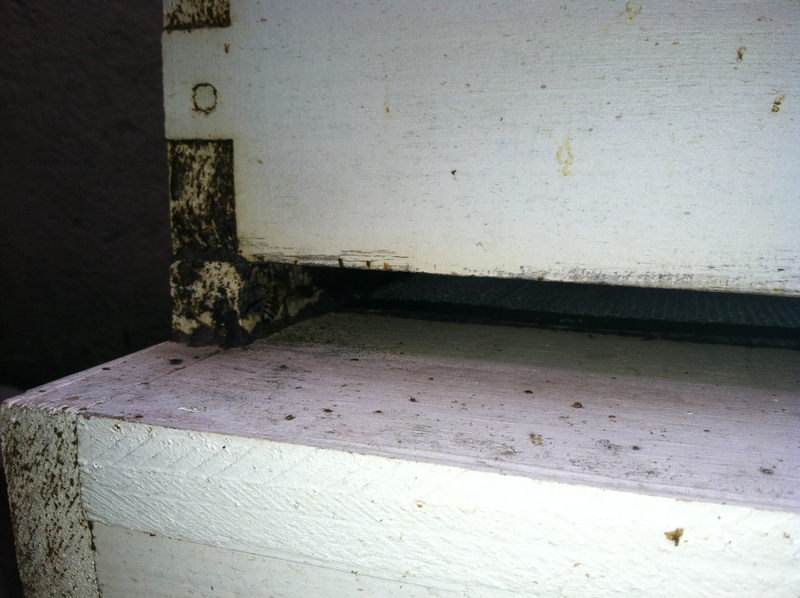 I was informed that since the weather was cold, there would be much less bees entering and leaving the hive. Puzzled, I was about to ask if the drawers would be open on a warmer day. Before I was able to question, Kelly ensued by pointing towards the bottom (shown above) where there was about a centimeter crevice. So this was the entrance where the bees would leave to pollinate and come back with nectar. She motioned for me to crouch down and peek inside the dark crevice. See if you can spot the bee, below. After getting to eye level with the beehive entrance, I finally could make out the dark miniature figure of many bees huddled around what appeared to be a comb. Curious to get a better look, I turned my head upside down and was delighted to see a screen checkered screen. 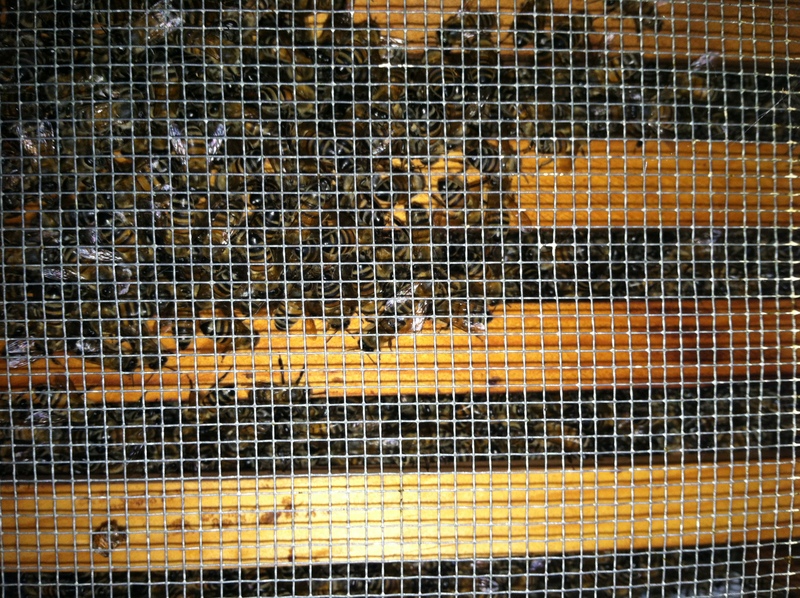 I took out my camera and turned on the flash, but hesitated asking, “Will flash scare the bees?” Kelly said that the bees do get excited from light, but “let’s find out.” As you can see below, there are hundreds of bees huddling inside the hive, around the comb. Did you know that bees are the only insect that produce food that is edible by humans? 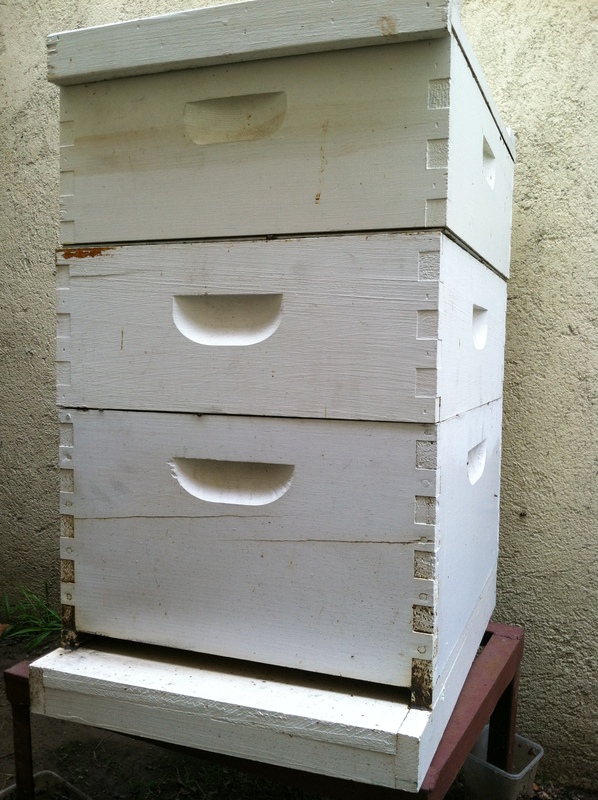 Stay tuned for the humble beginnings of Backyard Bees… What were your first thoughts of what a hive would look like? Place your comments below! Did you know that bees are the only insect that produce food that is edible by humans? < –this is not counting the many insects that we eat as our tasty Chinese cuisine.